THAT YOU CAN ASSEMBLE YOURSELF IN MINUTES. There’s absolutely no helium, and you can reuse it, again and again, with new giant balloons. WITH UNIQUE ACCESSORIES, IN A WIDE RANGE OF COLOR CHOICES. A dressing kit includes ONLY THE FUN PARTS of a Pompalloon, along with easy instructions for assembly and disposal. With dressing kits you can make new Pompalloons at a fraction of the cost, using stilts and bases that were purchased previously. 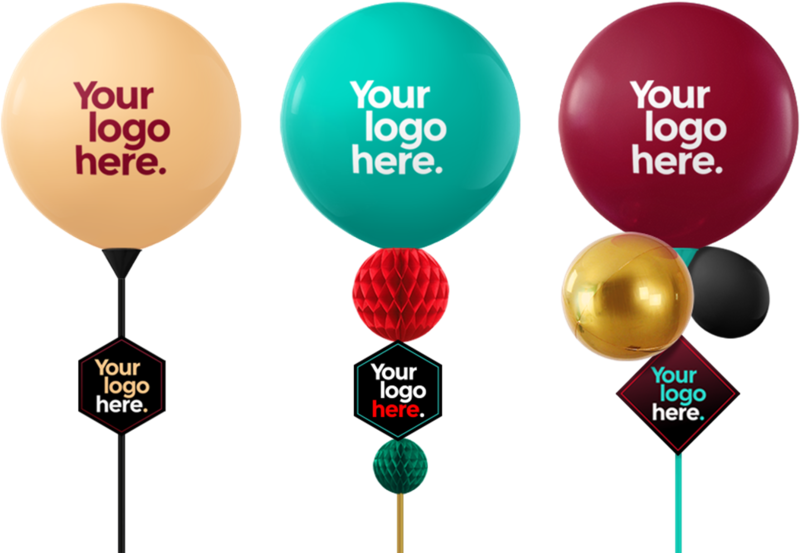 A printed graphic can be added to the top balloon of any Pompalloon design. Many designs are also available with snap-on printed medallions, available in standard shapes of round, diamond, hexagon, square, and rectangle. Volume discounts is just one of the perks of becoming a Key Account customer. You’ll also get access to our design studio, which offers customized design proposals tailored to your needs. To inquire about Key Account status for your company, fill out our simple contact form, below. We’ll get in touch within 24 hours. How many Pompalloon setups do you think you’ll need per year? A setup is one occasion when a Pompalloon is used — either new, or with a dressing kit. The minimum amount required to establish a key account is 100. 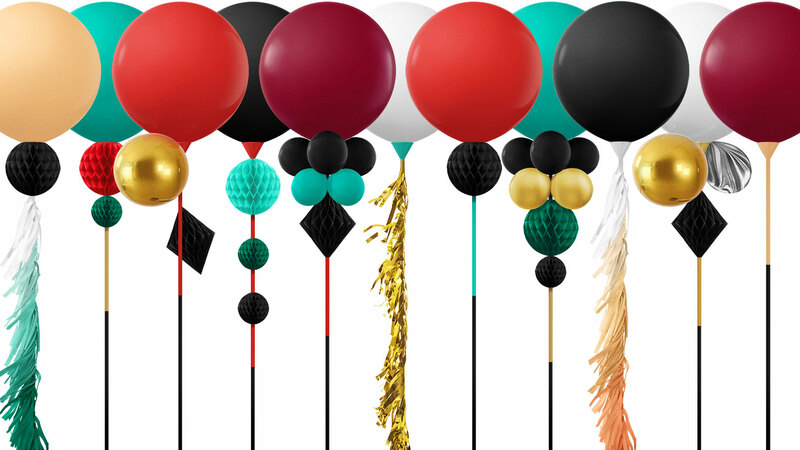 Pompalloons offer genuine environmental advantages over traditional balloon decor. For starters, they don’t use helium — meaning escaped balloons won’t fly away and end up in nature, where they could pose a hazard to wildlife. Pompalloons include no single-use plastic parts. Decor elements are made of recycled craft papers, and all our balloons are 100% biodegradable natural latex. Currently, Pompalloons are available for shipment in Sweden, Norway, Denmark, Finland, Germany, Estonia, Lithuania and Latvia. Bulk orders to countries outside this range may be accepted, depending on the specific request. Please contact us to discuss your needs. Pompalloons are ordered in even-number quantities, and are shipped in cases containing either 2 or 4 units. Our shipping cases are easy to carry and are designed to double as storage boxes, to help protect your parts from loss or damage between uses. ARE YOU A PROFESSIONAL BALLOON DECORATOR? Pompalloon® is a concept developed by balloon decorators, for balloon decorators. It’s a tried and true method, with great appeal, convenience, and flexibility. To become an official Pompalloon Decorator, get in touch today. As a member of the Pompalloon family, you’ll not only be licenced to use Pompalloons in your own decor work, you’ll also get access to special decorator’s tools and products, and be eligible to receive contracted work from us for clients in your area who want professional assistance.